Karla said A.J. was non-responsive for approximately 20 minutes before he breathed again. The ongoing storm prevented LifeFlight from responding so A.J. was transported to the hospital by ambulance. Local media reported two teammates were also injured by the lightning strike. Boise, ID - Idaho Army National Guard Capt. A.J. 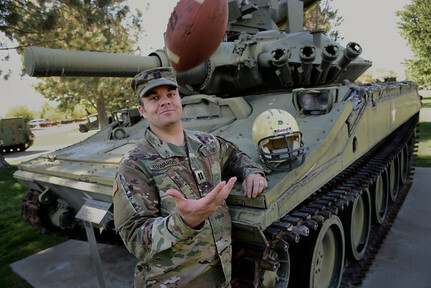 Edwards poses for a photo while tossing a football Sept. 27, 2018, on Gowen Field, Boise, Idaho. Edwards was struck by lightning on Sept. 30, 1998, at a football practice in Inkom, Idaho. He was wearing the helmet and holding the football shown. His teammates signed the football. BOISE, Idaho - The National Weather Service estimates the odds of being struck by lightning in the United States are one out of 14,600. Despite those odds, Idaho Army National Guard Capt. A.J. Edwards was struck by lightning playing football as a 12-year-old 20 years ago. Doctors told his parents he might not live, and that if he did live, he might not walk again. Edwards beat those odds. The lightning temporary ended his life and caused him to relearn how to walk. He ran track for his school the next spring, ran a marathon the following year and earned an ROTC scholarship to Brigham Young University – Idaho. He enlisted into the Idaho Army National Guard in 2010 and earned his commission in 2013. Edwards was struck by lightning Sept. 30, 1998. The last thing he remembers that day is riding his bike to football practice in Inkom, Idaho. His mother, Karla Edwards, remembers A.J. didn't want to go to practice that day because it was hot. She made him go anyway.